Hey there, y'all. Please pardon, once again, the delay in regular service here at Flaming Pablum. It was a busy week over at the Job, and next week promises to be even busier, as next Wednesday, February 9th, is the 48th Annual Grammy Awards, which my organization will be covering with a vengeance. In any case, I thought I'd take this opportunity at the end of the week to check in here and do some updating. After seven years (and two club residencies) of providing the musical backing for hundreds, perhaps thousands, of folks every single Monday, the pr/hm—k band will for the near future be operating as free agents, playing clubs like any other NYC band. 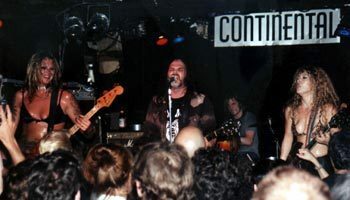 Many of you may be aware that the Continental, a bastion of hard rock of one sort or another for 15 years, will no longer be presenting live music, opting instead to sling cheap drinks for (the following are the club's owner's words) "the bridge and tunnel" crowd starting in the spring. While this is hardly surprising, given how the neighborhood's real estate environment is no longer hospitable to club-level music (or that cool kids migrated elsewhere long ago—take your pick), it's kinda sad. You could point out that the club's booking was not terribly competitive, and we wouldn't disagree. The band decided to end our residency there before we knew of the club's decision. With a copycat band playing at the club that hosted us for six years, and in light of other similar acts spread around town, it was simply unfeasible to continue at a place that, punk rock bona fides aside, was located in a neighborhood where folks don't go to hear music anymore. So we'd like to find another residency at another club and on another night eventually. In the meantime, we'd be thrilled to see you throughout Feb. If you wish to sign up for our mailing list, please proceed to our website : Punk Metal Karaoke.Com, where you may do so. Also, like every living musician, we have a page on Rupert Murdoch's recent acquisition: MySpace. Let us know if you have any suggestions for bookings, or if you are interested in booking us for a party.